The fifteenth housing start of the year is located on 103 Ave. just West of (behind) the SAAN store. 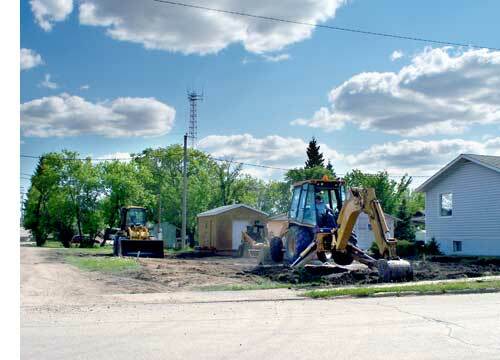 An older small house had been located on this lot and it was knocked down last fall in preparation for a new dwelling. 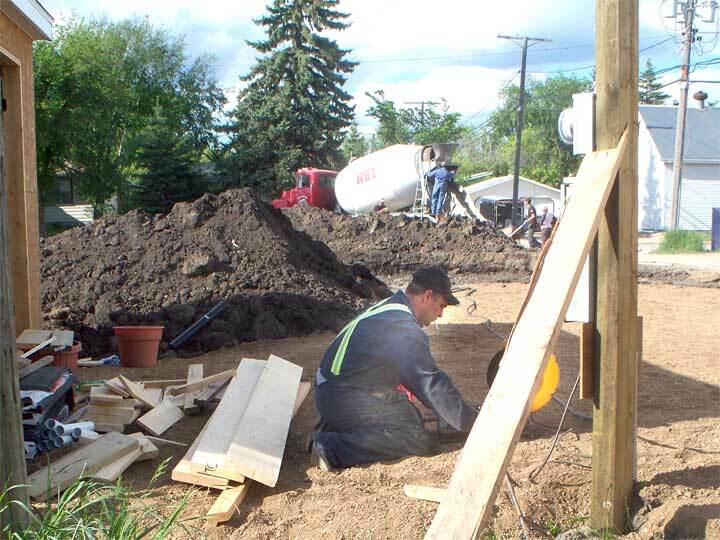 It was on June 9th (right) when Chupa Excavation and Trucking dug in the water and sewer services for the lot then on June 17th (below) the excavation for the house was done and the fill hauled away. 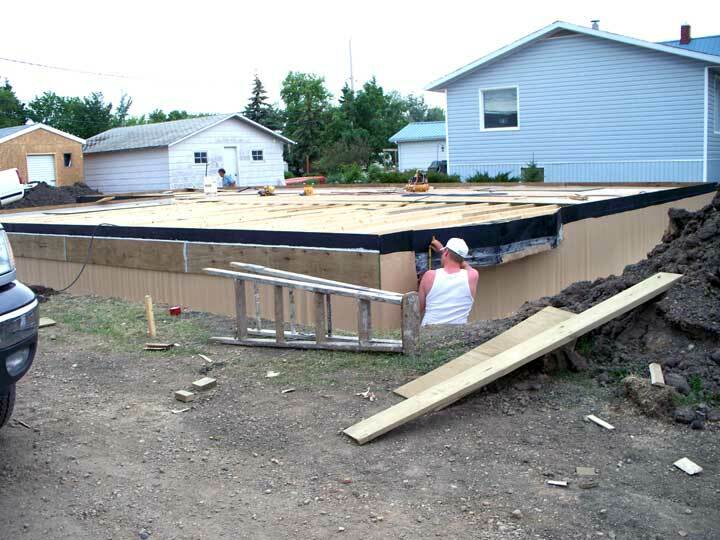 This is going to be a good sized house and takes up a good portion of the whole lot. In this picture taken at around 2:45 that afternoon you can see the whole area that has been cleared out and the water and sewer lines coming up on the right hand side of the picture. As you can see this excavation is to shallow for a basement but is intended as a crawl space for a house built right on its foundation. In the picture below take late in the working day (5:30) the forms for the footings have just been poured with a perimeter wall and pads. 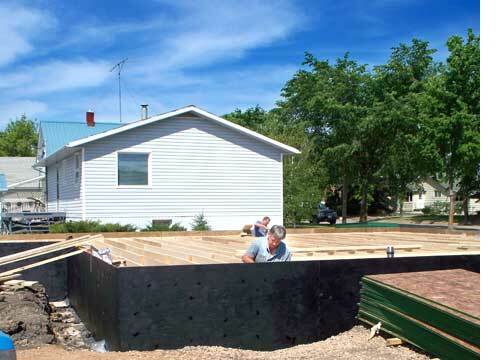 This picture shows the filled foundation pads and perimeter at 5:38 last Wednesday afternoon. 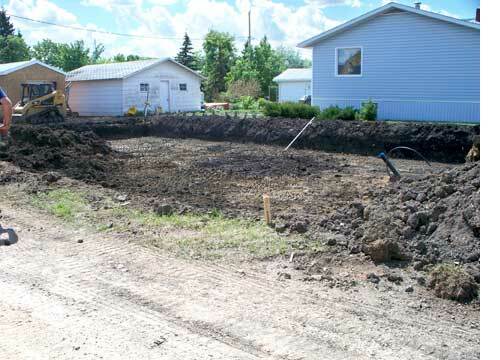 Work proceeded immediately on constructing the foundation for the house. Using treated lumber and giving the outside two treatments of coatings to protect the structure this (below) is how the project looked at six o'clock on Friday, June 20th. 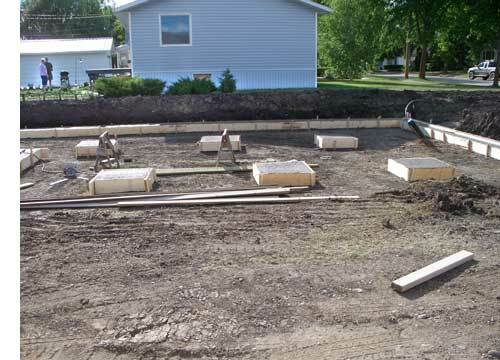 The crew worked through the weekend including Sunday to get the foundation completed then installing the floor joist on beams running north and south supported by the footing pads. This is how it looked yesterday with a coating of preservative on the treated lumber before another coating was applied to seal the surface. In this picture the floor pieces are all in place and the project just about ready to install the floor sheeting which was on the agenda today as you can see in the picture taken this afternoon at the top of the page. It is interesting that house sixteen with foam form concrete is being constructed in a similar manner.